Introducing Comprehensive Drone Surveying Services - Fox And Associates, Inc. Since its founding in 1966, Fox & Associates, Inc. has specialized in land surveying. We’ve grown to provide a comprehensive range of zoning, land planning, surveying, engineering and environmental services. We’ve built the firm on the promise of “prompt quality services”, a philosophy that has enabled us to maintain a repeat client base since our inception. Through the years, we have stayed at the forefront of technological advancement to most efficiently serve our client base. To that end, we are excited to announce the acquisition of an important new tool that will empower us to provide survey deliverables more promptly and accurately than ever before. Fox & Associates, Inc. is pleased to announce that our survey team is now ready to deploy a Microdrones mdMapper1000DG system for your projects. This is a fully integrated drone surveying system that uses the power of direct geo-referencing to quickly collect data in a manner that is efficient to process and visualize. From ortho-mosaics to 3D point-cloud models, this new technology gives us the capability to plan and design our client’s projects with more speed and efficiency. The drone will also be helpful for checking the status of ongoing construction projects as they progress. This will especially beneficial for our out of town clients. Adoption of this technology is much more than just acquiring a new piece of equipment; it’s a whole new way of getting work done efficiently. Our team members, Richard Nagel and Travis Herrold have completed 40 cumulative hours of training on the system, workflow, software and best practices. 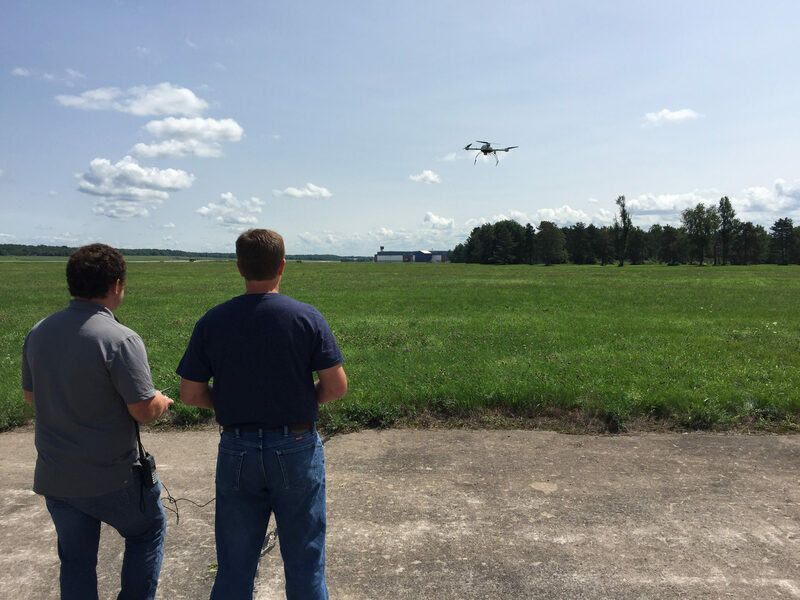 Mr. Nagel and Mr. Herrold have also obtained Professional FAA Certification required to operate the drone aircraft. Fox & Associates, Inc. continually strives to provide our clients with the very best data and deliverables to make every project a success. The addition of drone technology is a very exciting time for our team of skilled geomatics professionals as well as our customers. This leading edge technology will undoubtedly enhance our corporate ability to provide our clients with “Prompt Quality Services”. The photograph below was taken during the maiden voyage of our giant leap into the next generation of surveying technology. Contact us to learn more about using this system on your next project! © 2019 Fox And Associates, Inc.